Restaurant chain McDonald’s is to give away nine million copies of Michael Morpurgo’s Mudpuddle Farm books in its McDonald’s Happy Meals for children, as part of a promotion with HarperCollins Children’s Books. The initiative will run from today, 11th January, to Tuesday 7th February. Customers ordering Happy Meals will be offered a free book from a selection including six titles from Mudpuddle Farm range including Mossop’s Last Chance, Pigs Might Fly! and Martians at Mudpuddle Farm, all aimed at children aged six to eight years. Each book comes with a finger puppet and books will also be available to purchase at McDonald’s restaurants without the need to buy a Happy Meal. The initiative is being publically backed by TV presenter Jeff Brazier. To please fans, a painting of Joey, Michael Morpurgo’s equine hero, has finally been hung in Iddesleigh village hall. For years, fans of the Michael Morpurgo story War Horse have made the pilgrimage to the village hall where – according to the author’s note at the start of his book – a “small dusty painting” of his equine hero hung. They came away disappointed. The hall at Iddesleigh in Devon, not far from the author’s home, did exist but there was no picture – until now. On Wednesdaya painting of Joey the horse, commissioned by Morpurgo to turn what he called a “black lie” into a “little white one”, was finally hung almost 30 years after the book was published. Morpurgo said: “The author’s note is an invention – it’s how I wanted the story to start. For 30 years people have taken it literally. But since the National Theatre’s production became a huge hit, the trickle increased. Once Steven Spielberg’s film version of the story is released later this year in the US and in the UK soon after, a flood of new enthusiasts are expected to arrive in the village. Bestselling children’s author Michael Morpurgo speaks about Steven Spielberg’s film adaptation of War Horse at the inaugural Telegraph WordUp! Festival in Dulwich. When the BBC presenter Clare Balding introduced Michael Morpurgo at the inaugural The Telegraph WordUp! Festival she did not stint on praise: not only was he one of our great children’s authors, but “one of the greatest tellers of stories for any age”. It is part of the etiquette of such events to make the star author feel special – but sitting among a crowd of 300 enraptured children (and not a few adults) it felt like it could be true. “Our problem is that we feel superior to animals,” he continued. He spoke movingly about how children have a natural connection with animals that adults brought up to fear them lack. In the course of his admirable Farms for City Children programme that he runs with his wife Clare, Morpurgo has seen young people boldly take eggs from hens and instinctively bond with horses. 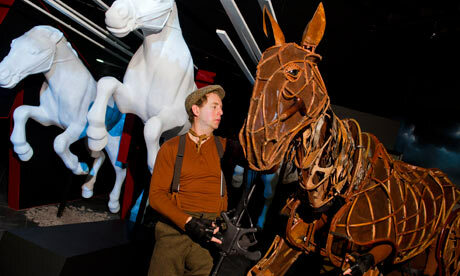 War Horse: why has it been such a hit? After four years, the adaptation of Michael Morpurgo’s book is still going strong, and providing the National Theatre with vital income. But why do people love it so much? In racing parlance, War Horse is a “stayer”. It’s been running in London for four years, is still enjoying a profitable outing on the notoriously tricky Broadway course and, according to the National Theatre, is earning enough (£3m a year in the West End alone) to make up for the company’s shortfall in subsidy. 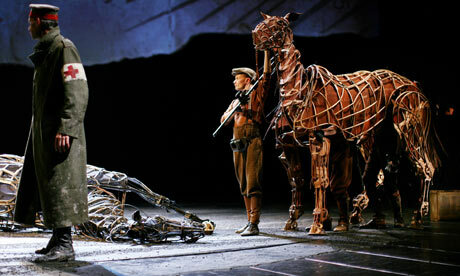 Just as income from Les Mis helped to keep the RSC afloat in the 1980s, so War Horse enables the NT to balance its books in the years of George Osborne’s austerity. But what is it that makes War Horse a popular success? First and foremost, it’s the spectacle. Audiences still gasp at the ingenuity of the Handspring Puppet Company who give the horses, through their bendy, bamboo frames, an articulated, individual life. It’s a truism but there comes a point when we forget the horses are manually operated and imagine them, in the words of the Chorus from Henry V, “printing their proud hooves in the receiving earth”. But equally remarkable is the moment when a simulated first-world-war tank, signalling the cavalry’s demise, rolls ominously towards the audience. 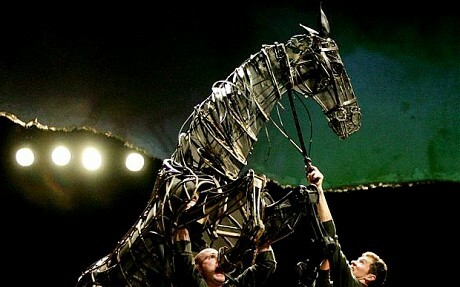 Technical skill alone, however, doesn’t explain War Horse’s wow-factor. Michael Morpurgo’s novel Shadow has won this year’s Red House children’s book award, which is voted for by young readers. 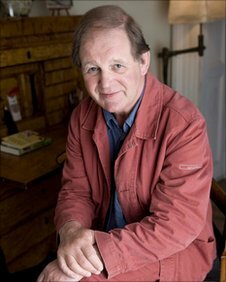 It is a third win for Morpurgo, who becomes the only author to do so in the award’s 31-year history. “Shadow was a difficult book to write because I was writing about a contemporary conflict,” Murpurgo said. 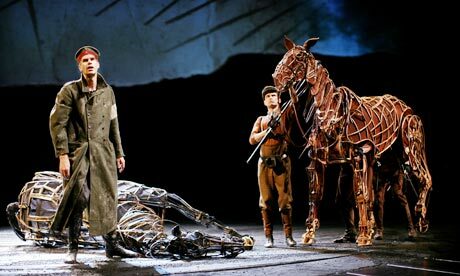 An orchestral performance of War Horse will be one of the highlights at this year’s Telegraph Hay Festival, part of a line-up that includes one Hollywood star, four Nobel Prize winners and the leading lights of the arts world. The literary festival, which runs from May 25 to June 5 in Powys, Wales, promises to be the most eclectic yet.